Earlier this year, we ran a trial of GOV.UK Verify basic accounts. The trial ended in July, and this is an update on how it went. This type of trial during the beta stage of our development helps us explore how we might continue to develop GOV.UK Verify to meet user needs. This post is about what we did and what we learnt. We’re working with departments to decide what, if anything, we’ll do next with basic accounts and we’ll post about that when we have news to share. GOV.UK Verify is still being developed in beta, and doesn’t yet work for everyone - we’re aiming for a 90% success rate by the time we go from beta to live. We’re on track for this at 70%. People whose identity can’t be verified still need to be able to access services safely and securely. Also, some government services and transactions need less proof of identity than others. 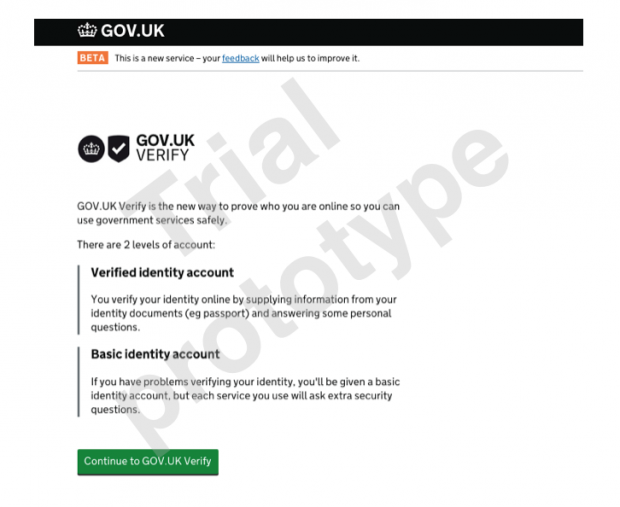 So earlier this year we carried out a short trial of basic identity accounts to learn how GOV.UK Verify could be developed to meet these needs. This was a complex build and design challenge, which we delivered in a very short space of time. We learnt a lot that will help us plan the future development of GOV.UK Verify and make sure we’re working as effectively as possible to understand and meet user needs. In the trial, anyone whose identity couldn’t be verified (because of lack of proof, for example), was given a new option. Rather than being directed to other routes taking them offline, users were offered a basic identity account. Basic identity accounts consisted of a secure way to sign in online, without being fully verified. People could re-use their basic identity account for different services, and people who set up basic identity accounts as part of the trial will be able to upgrade to verified identity accounts. We carried out 9 rounds of user research in our lab before launching the trial. We used that time to design a user journey that was as straightforward as possible for users. During the trial we collected and analysed feedback from users and data from patterns of usage, success, failure, and dropout. This gave us a lot of evidence about how basic accounts worked, and ideas about how we might develop the proposition in future. During the trial, users created 170,000 basic identity accounts and 100,000 verified identity accounts. The completion rate and the account creation success rate for GOV.UK Verify increased during the trial, as people who would otherwise have needed another way to access services were able to continue online using a GOV.UK Verify basic identity account. Designing effective, straightforward services to meet a range of complex needs in different scenarios is difficult (that’s why one of the GDS design principles is ‘do the hard work to make things simple’). Online identity assurance and GOV.UK Verify are already novel concepts for most people, and basic identity accounts were an additional function to build and explain. We usually test GOV.UK Verify fortnightly in the lab and iterate constantly. In preparation for the basic accounts trial we moved to weekly testing to give ourselves the maximum opportunity to learn and improve the design. Working on a new feature at this pace reminded us how important it is to communicate rapidly and effectively across a big, multi-disciplinary team every day, sharing learning and progress, and making sure everyone has the opportunity to contribute. Clear, swift and effective communication can be difficult to maintain when you increase your pace and are trying to do something new whilst also continuing to develop and maintain your live service. We had all the usual routines of planning sessions, standups and retrospectives. But we found that we also needed more frequent and in-depth interaction between our teams than we would normally have. We also needed to work even more closely with other teams in other government departments and certified companies to make sure everything happened in a coordinated way. If we repeated a trial like this in future, we would want to be more mindful of these extra needs from the beginning of the process. We’ve also taken the learning from this into consideration when thinking about how we work more generally. It’s important to us to maintain users’ confidence in GOV.UK Verify’s ability to protect their privacy, and not to confuse them by offering different types of account within a service that’s already novel for most people. We tried a range of ways of explaining the difference between what became known as basic and verified accounts. Of the options we tried, we found that the terms ‘basic’ and ‘verified’ worked best - they gave users a more immediate and clear understanding of the difference between the two types of account and the idea of upgrading from basic to verified accounts. Overall, the level of understanding was good among people who took part in the trial, but there would be more work to do in future to minimise the risk of confusion. If we offered basic accounts again in future, we’d want to carry on working to make sure there was a really clear and consistent proposition for each type of account. The user went straight through the GOV.UK Verify process and verified their account. During the initial standard GOV.UK Verify questions, it became clear the user didn’t have enough evidence for us to be able to verify their identity online, and they were shown identity providers that offered basic identity accounts. The user had the proof required and answered the questions correctly, but GOV.UK Verify still couldn’t verify their accounts. This group went through the whole GOV.UK Verify journey, and were then offered basic accounts. We expected the third route to be the least satisfying, and this was borne out in the trial and in testing prior to the trial, where we unfortunately saw some frustration and confusion from users. If we were to offer basic accounts in future we would need to do more work to make this route work more effectively for more people, based on what we learnt in the trial. One example of how we might do that is to pass information from GOV.UK Verify to the certified company a person chooses. When someone uses GOV.UK Verify for the first time, they’re asked questions (for example, “do you have a UK passport / photocard driving licence / other passport”) to help direct them to a provider that’s likely to work for them. Once a user has chosen a certified company, they’re directed that company’s website, to set up their identity account. Currently we don’t share any information with certified companies about the answers a user has given before choosing the company. It may be possible in future for users to consent to their answers being passed on to their chosen certified company, so they don’t need to be asked a second time. In the case of basic accounts, the certified company would be able to save time for the user by offering a basic identity account straight away to anyone unlikely to be able to verify their account, rather than repeating or asking further questions. However there are privacy, technical and security considerations that need careful research and consultation before we’d decide to pass on information in this way - we’re looking into these in more detail before we decide whether to explore this in future. Our priority now is developing and continuing to improve GOV.UK Verify so it’s ready to move from beta to live by April 2016. As part of planning future development of GOV.UK Verify, we’re also working with departments and services to assess whether there is a role for basic identity accounts, either in the form offered during this trial or something different. We’ll post again here once we’ve developed our thinking and have further news. Get the latest news from the GOV.UK Verify team by signing up for updates.